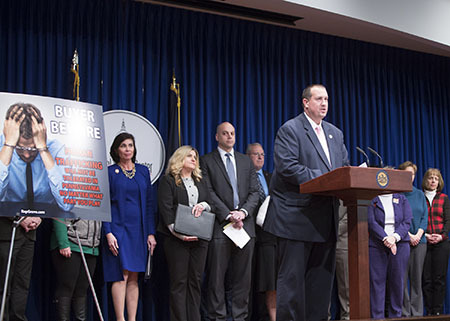 Rep. Seth Grove (R-York) and Sen. Kristin Phillips-Hill (R-York) were joined by advocates for a press conference in the Capitol on Wednesday to unveil the Buyer Beware Act, joint pieces of legislation in the House and Senate to increase penalties on criminals convicted of certain human trafficking offenses. Human trafficking is estimated to be an $100 billion global industry. It happens in all corners of Pennsylvania and impacts people from all walks of life. No one is immune from this heinous crime. The Buyer Beware Act will ensure those who are convicted of crimes related to human trafficking will feel the full force of our justice system while providing justice to helpless victims. We must get tougher on these villainous criminals who rob victims of their God-given right of freedom. To learn more about the press release, click here. The legislation would increase the maximum jail sentence and fines for an individual convicted of trafficking or patronizing a victim of trafficking. In light of the connection between prostitution and human trafficking, the legislation would also increase fines for repeat offenders of those patronizing prostitutes. The money from this fine would go to fund grants given to anti-trafficking programs and the Safe Harbor for Sexually Exploited Children Fund. The bill would also expand the definition of human trafficking in the state Crimes Code to match federal law. To learn about the specifics of the Buyer Beware Act, click here. To view additional photos from the press conference, click here.